Charles Darwin published On the Origin of Species in 1859. The original title was On the Origin of Species by Means of Natural Selection, or the Preservation of Favoured Races in the Struggle for Life. When the sixth edition was printed, the title was shortened to The Origin of Species. The book included information from his time aboard the Beagle expedition in 1830 and other research and correspondence. 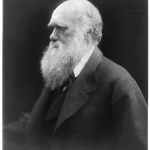 Children can read The Origin of Species and other books written by Darwin at: Project Gutenberg.